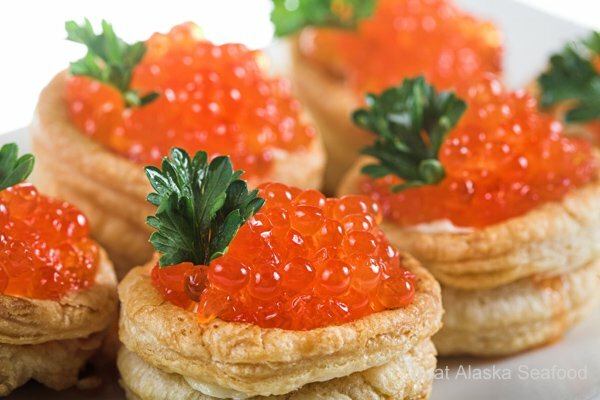 Salmon roe is a fantastic way to make your own caviar or use for your own creative recipes. They're delicious, sustainable, and economical. An entire sac of roe is called a skein. This is ROE, not brined and untreated. Fresh out of the fish, vacuum sealed and flash frozen. We have FRESH -never frozen- salmon roe occasionally during the fishing season. Would you like to be notified when this very special treat is available? Click the button below, leave your name and phone number below, and we'll call when fresh salmon roe is available. Whisk the eggs with the cream and set aside. Place a skillet over medium heat and the butter. When the butter is melted, add the eggs, and whisk to form the eggs into a curd-like texture. When the eggs are halfway set, add the roe and stir around briefly, then turn off the heat and let the heat of the pan continue to cook the eggs for a few more seconds.